The time that we have a table clock in the kitchen putting purely to know the time is a long time behind us. We are daily watchman with time. Nowadays, a Riverdale table clock more a style object with a decorative function. As you may know, Riverdale takes style very seriously. That is reflected in the Riverdale table clocks. Beauty is in the detail. You can immediately see when you anywhere is a Riverdale clock. Small details make up a stylish environment that you can have years of pleasure. No Riverdale table clock is the same whether it is a large or small. Each clock Riverdale is made by hand and this gives a luxurious and unique look. Each table clock has its own unique features which make it a just slightly different design comes into its own. 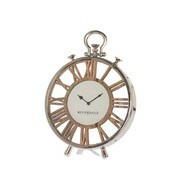 Riverdale has various collections such as the Newbridge , Grand Cafe and Time collection. When you choose a Riverdale clock , you must be wondering what exactly that extra touch that you want to give your interior. What is the best clock for you? 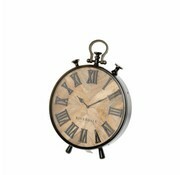 A stylish clock is an excellent functional and decorative middell. Combine the table clock along with other accessories such as lamps and lanterns for a complete picture. In addition, the choice varies between tough, robust and prominent, and the other subtle and minimalist. It is of course important to observe the rest of the interior.